NES Star Voyager (USA) in 13:29.53 by HeyHorhey. 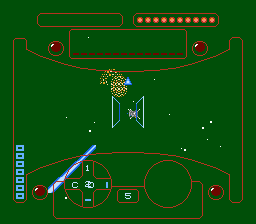 Star Voyager is an outer space shooter for the Nintendo Entertainment System. The gameplay is a first-person shooter from inside the cockpit of a spaceship. The player navigates "sub spaces" of a larger "world map." Gameplay takes place between different subspaces.